Lots of things to discuss on both sides of the ball, but for the sake of getting this off the ground, let's dive into the offense first. I did about a half hour interview with WiscoBadgers last week where I address a number of offensive and defensive issues looking forward to the 2011 season. Michigan QBs Denard Robinson and Devin Gardner. Last year's offense was simply unstoppable, sans the Ohio State game and Gator Bowl. Much of the blame for Michigan's offensive ineptitude in those games can easily be placed on our total lack of ability to stop the other team from scoring. That, no kicking game, and turnovers are the main components of our offensive struggles late last year. Quite simply, it's just not fair to ask your offense to score touchdowns every time they have the ball. Denard Robinson, who reinvented the role of a Michigan QB into a beautiful hybrid of a speedy back with the ability to throw the ball with relative accuracy, wowed Michigan fans all year. When Rich Rod was asked to step down, fans held their breath to see if Denard would leave as well. 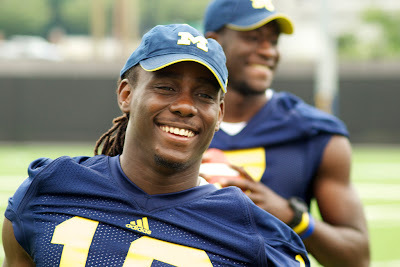 But those fears were short lived as Denard quickly reaffirmed his devotion to his teammates and the Michigan program. But Denard's record-breaking season came at a price, which was more and more evident as the season went on...and that was his ability to stay healthy for an entire game. Denard has great ability, no one questions that, but he also ran the ball like a sophomore who thought he couldn't get hurt. What I am looking for is a guy who can pick and choose when it's time to run, and when it's time to simply throw the ball away and live to see another down. Entering the 2011 under a completely new system, the big question is whether Borges will adapt his system to suit Denard's ability. And if he does, can Michigan become just as successful, if not more so, with a system that will be new to everyone. I think the last thing Borges wants to do is sabotage a system that has been proven to work, simply to run his own style (sound familiar?). Michigan relied heavily on the RB by committee last year, which kept the ball spread around quite frequently among a stable of young backs. Vincent Smith, Michael Shaw, Michael Cox, Stephen Hopkins and Fitzgerald Toussaint all saw decent action last year. Add in freshman Thomas Rawls, who has been making some noise so far this camp, and you have to divide up the pie even more. Expect to see all of these guys, especially early in the year. Al Borges has said all along that he wants a featured go-to back for this offense. And let's face it, when you want to morph a spread-option attack into a more traditional power offense, you need a dependable back who can get 20-25 carries a game. Think Mike Hart or Chris Perry. Question is, is there either one of those in the names listed above? Of course any discussion about running the ball must include Denard. Make no mistake, Borges knows he can, and will run the ball. Do not think for a second that Denard is going to look more like John Navarre rather than what we saw last year. Denard is still Denard. And Borges knows that. He might not average 120 yards a game like he did in 2010, but he'll still get his fair share of carries. Anyone would be crazy not to let Denard play to his strengths. However, you'd also be crazy to let him put himself into injury situations like he did so often last year. Picture this: 1st and 10. Denard lines up under center. A RB and FB lined up in an "I" behind him. Two WRs split out and a TE lined up on the line. Denard drops back, backs split out to the flats. Denard checks off his receivers and hits the TE over the middle between the LBs and beneath the coverage on a slant for 8 yards. Okay, now take that image and then picture the next play. 2nd and 2. Denard lines up in the gun. 2 WR's split to the right, 3 to the left. Maybe Vincent Smith lined up in the slot. Line is in a 2-point stance. Denard fakes a quick screen to the left, play-action fake and rolls out right...the whole time looking run the whole way getting the safeties to bite, and hits a slot-WR over the back on the left for a 25-yard gain. That gives you a picture of what Michigan's passing game can look like in 2011. It will all depend on Denard's arm strength, his field vision and the receivers ability to get open. We're hearing Denard's completion percentage in fall camp has been north of 70%. Um...yes please. Add in a experienced corps of receivers, not Darryl Stonum, and good depth and you have a nice, hopefully potent progression from one year to the next that would lead us to believe that this might be Michigan's strength heading into 2011. If anything, the pro-style offense makes Denard that much more dangerous and tough to defend. With the spread-option, you knew it was going to be the Denard show. With a pro set, it will hopefully be three or four guys who can decently carry the load. Another huge strength of Michigan's offense is it's depth and experience up front. This line has been through the ringer in terms of going from one offensive scheme, and OL coach, to the next. A couple years ago, Michigan had huge holes to fill on the offensive line. That lack of experience led to a lot of guys seeing the field and often. 2011 will be the year that a lot of that experience pays off. Across the line, Michigan brings back 3 starters from last year, and a host of backups which saw plenty of playing time as well. Standouts like center David Molk, guard Patrick Omameh and tackle Taylor Lewan anchor a line that must adjust, and quickly, to a more power attack. But I don't think that transition will be a problem for this veteran group. From everything I've seen and heard, this group will have no trouble with getting past any scheme hurdles. Michigan brings back almost the entirety of one of the most potent offense in the country last year. We need to fill a couple starters on the line, but we have so much good depth there, I don't foresee that being anything that will hold this team back. If we can limit the turnovers, and add in a defense with a pulse, Michigan's offense should be able to cruise to numbers maybe better than what we saw last year. The workload will be shared better by the skill position players, and that will hopefully lighten the burden on Denard to have to make huge plays on every down. While the real work that needs to be done is on the defensive side of the ball, the offense should be able to do their part in keeping the defense off the field as much as possible. Maybe less of the breakaway runs by Denard could end up being a blessing in that regard. Long sustained drives are beautiful on two fronts...they keep your defense off the field, and they can demoralize an opposing team. That is my hope and expectation for 2011. By the way, the name "Denard" appears in the article 24 times.